US 11 begins in the northeastern corner of New York at the Quebec border very close to Vermont. The route heads west across New York to Watertown, where it begins heading south, passing through Syracuse and Binghamton. While in Pennsylvania, US 11 starts heading southwest, passing through Scranton and Wilkes-Barre, before riding along the banks of the Susquehanna River on its way to Harrisburg. After passing briefly through Maryland and the northeast corner of West Virginia, US 11 arrives in Virginia, where it continues heading southwest through the Shenandoah Valley. US 11 parallels the Virginia - West Virginia border to Bristol, where it crosses into Tennessee. Between Bristol and Knoxville, the route splits into US 11W and US 11E. From Knoxville, US 11 continues southwest to Chattanooga. 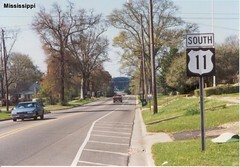 US 11 passes through the northwesternmost corner of Georgia before arriving in Alabama. Continuing southwest through Alabama, the route passes through Birmingham and Tuscaloosa, then heads on to Mississippi where it passes through Meridian, Hattiesburg, and Picayune. US 11 next arrives in eastern Louisiana, where it passes through Slidell, crosses the eastern side of Lake Pontchartrain, and ends at US 90 to the east of New Orleans. When I drove US 11 from New York to Louisiana in April, 1996, I followed US 11E through northeastern Tennessee. The photographs at the links below were taken during this 1996 trip. View individual pictures of US 11 on Flickr. Learn about how the alignment of US 11 has changed since it was originally commissioned. Information about the ends of US 11 can be found here on the www.usends.com website. Additional photos of US 11 in Pennsylvania can be found on the Pennsylvania Highways website. Additional photos of the New York, Pennsylvania, Maryland, and West Virginia borders and many other places along US 11 in Pennsylvania can be found on the Central PA/MD Roads website.